I know this sounds cliche’, but hope is an amazing thing – the coffee tastes a little sweeter today, my work and responsibility as a small business owner doesn’t seem as overwhelming and it’s freezing cold but I am only noticing the sun. Today the word hope is tangible – it has “real” meaning. What a day! 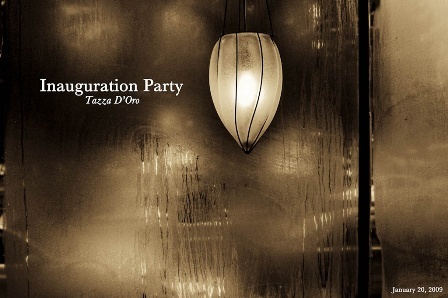 From about 8 am to 1:30 pm we had well over 60 people stop in Tazza D’Oro to watch the inauguration of President Obama. As long as I’m around I will NEVER forget my experience or the people I had the chance to share the moment with. Thank you! It just happened that we had a photographer on site, Anthony Musmanno, who was there to do a photo shoot for an upcoming issue for a fabulous magazine. Anthony captured the moment that will forever be archived for Tazza D’Oro. Thank you, Anthony. The photos are beyond words and for me just pure, raw emotion! See the photos – click here. The photos were great. The sepia tone was an added benefit here as it was a historical event and the photos had an air of history with that tonal quality. I only wish I had been there instead of watching at home. Cudo's Amy. You should have some of these framed to hang in the shop.